Matt and Laura Kollar are already searching for a new home for their hardware store, Matty K&apos;s, which was destroyed by a fire in August. 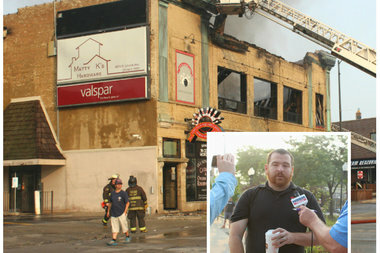 LINCOLN SQUARE — When news spread that Matt and Laura Kollar's hardware store, Matty K's, had been devastated in a fire that also destroyed Lincoln Square Lanes, neighbors quickly rallied around the couple and their young daughters. "The first thing we thought about was 'How can we help them?' We knew it was their livelihood," said Kim Randle, who lives next door to the Kollars on a tight-knit block in West Rogers Park. "We know they have insurance," she said. "Our thought is that's still not enough," particularly for expenses that fall outside of what insurance will cover. An email chain circulating among concerned neighbors prompted Randle to organize a fundraiser, scheduled for Nov. 29 at Candlelite, 7452 N. Western Ave.
She corraled musicians, businesses and restaurants into donating services, food and raffle prizes, and hopes to raise $10,000 for the Kollars. The biggest challenge for Randle as a first-time event planner was convincing the Kollars to accept help. "They're just very humble people," she said. "We had one person in the neighborhood who convinced them they should go along — let us do this for you." Just as important as any dollars raised is the message of support the community aims to convey to the Kollars. "There is compassion in the world," Randle said. "We're all rooting for him." The Matty K's fundraiser will take place 2-5 p.m., Nov. 29 at Candlelite. Tickets are $30 (bring kids for just $7) and can be purchased online. Admission includes music, all-you-can-eat pizza and salad, soft drinks and entry in the grand prize drawing — dinner for two at Candlelite, theater tickets and a one-night stay at Evanston's Hilton Garden Inn.